The Comparative Labor Law Journal was founded in 1976 to provide a venue for the very best scholarship in the comparative analysis of labor law, employment policy, and social security issues. In 1997, the Journal moved to the University of Illinois where it was renamed Comparative Labor Law & Policy Journal and its Editorial Advisory Board broadened better to reflect its mission. With an extensive worldwide circulation, the Journal has become a major international forum for research, theoretical and applied, in an area of growing importance to the developed and in the developing world. For further information about the Comparative Labor Law & Policy Journal, as well as full text of articles, please visit our website. A publication of the University of Illinois College of Law and the United States Branch of the International Society for Labor Law and Social Security. Articles (in PDF form) from the current issue (Vol. 30, Issue 2 – Winter 2009) of the Comparative Labor Law & Policy Journal are available online. Articles (in PDF form) from past issues (Volumes 19 – 30) of the Comparative Labor Law & Policy Journal are also available online. $30 for subscriptions mailed to the U.S. 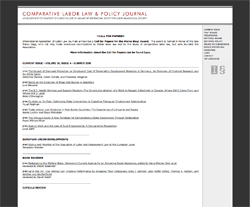 Comparative Labor Law & Policy Journal is professionally edited and refereed. Manuscripts will ordinarily be submitted anonymously for comment of experts in the field. Authors will be notified when the editors believe that the submission would benefit from such evaluation; they will be expected to revise in light of the reviewers’ recommendations. Submission to an external review must be understood to give the Journal a right of first refusal to the manuscript. All manuscripts should be submitted as a MS Word attachment in email. Footnotes should conform to the Uniform System of Citations commonly used in U.S. schools of law.